Give us a call at Green Clean Junk Removal to book your next junk removal service at 1-888-347-2851. Green Clean Junk Removal is your full-service junk removal company. We offer junk removal services for your home or business including offices, retail locations, construction sites, and more. Got old furniture removal, appliance removal, electronic removal, tire removal, construction debris clean up, or yard waste removal you need to make disappear? 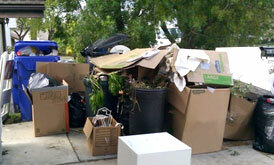 Green Clean Junk Removal can take away almost any material we can fit in our trucks, without you ever lifting a finger. We’ll remove junk from wherever it’s located, and we won’t leave a dent or speck of dirt behind. THEY WILL PROVIDE GREAT SERVICE!!!! I recently got quotes for construction debris removal and Green Clean gave me the best quote. I told the woman (Mary?) exactly what I had to pick up. Tile and wood that were piled up close to the entrance. She told me that it would be a nominal price.When they arrived, the guys were professional and very helpful!!! Will be using again!! !